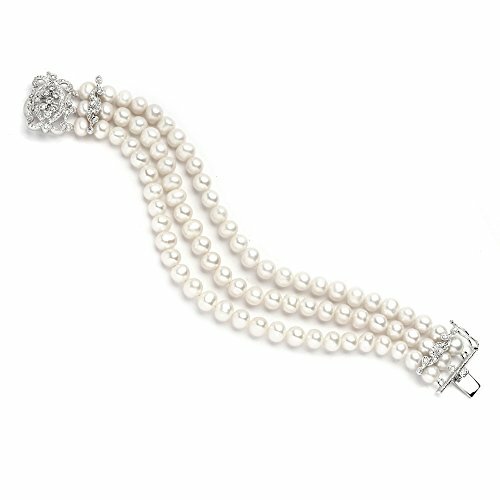 From Mariell's luxe collection, we present this breathtaking triple-strand pearl bracelet featuring Genuine Freshwater Pearls in an heirloom-style Art Deco design. The organic freshwater pearls are varied in size, shape and individual characteristics and come to you exactly as they occur in nature, giving this bracelet its distinctive look of priceless cultured pearls. Our 3-row antique reproduction bracelet boasts meticulous genuine Platinum plated vintage details with AAAAA quality Cubic Zirconia accents. We have crafted this beautiful pearl statement bracelet with an antique reproduction box clasp and safety closure usually found only on genuine diamond and pearl jewelry. This top-selling pearl jewelry is perfect for vintage weddings, special occasions or everyday glamour. With its timeless beauty and classic design, our pearl cuff makes an impressive gift and is a must have for any woman's jewelry collection. Whether accessorizing formal frocks or jazzing up your business wardrobe, you'll make an unforgettable grand entrance wearing this sophisticated estate-quality freshwater accessory. We promise you'll adore this best-selling pearl bracelet or your Money-Back. Treat yourself or someone you love to some ��Downton Abbey" vintage elegance with the look of fine estate jewelry at a fraction of the price! As always, enjoy Mariell's exclusive 100% RISK FREE Purchase and LIFETIME GUARANTEE.